12 December 2016 – New tools and insights into inhibiting the formation of biofilms by spoilage-causing Lactobacillus plantarum are the result of the research by Mónica Fernández Ramírez. The TiFN PhD fellow successfully defended her thesis on 2 December 2016, at Wageningen University. Her work provides new leads for the development of more-effective cleaning and disinfection strategies in the food industry. Biofilms consist of microorganisms attached to a surface and embedded in a protective matrix of extracellular polymeric substances. 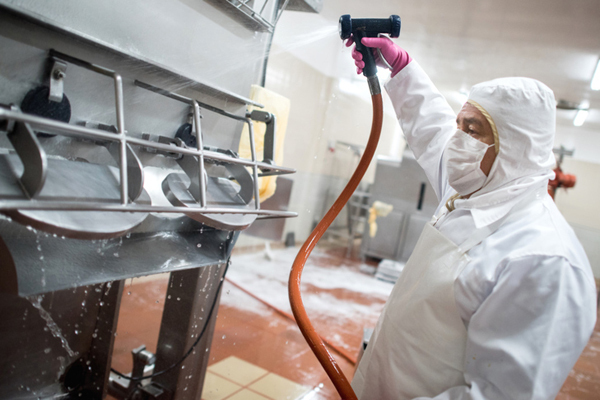 Within a biofilm, micro-organisms are protected against cleaning and disinfecting agents. Transfer of living biofilm cells to foods can result in quality decay or even worse. The PhD fellow discovered that, in the case of the single-strain biofilms, proteins and/or proteinaceous material played an important role in surface colonization and extracellular DNA, as components of the biofilm matrix. Lysis led to inactivation of cells, but the destroyed cells also helped in creating the biofilm. Performance of individual strains in dual-strain biofilms was highly influenced by the presence of the secondary strain; in the same dual combinations as floating cells this was not the case. Putting the microorganisms under stress conditions, such as high temperature and omitting the mineral managanese, affected the relative abundance of each strain as well as release of eDNA. The strains dominating the biofilms in static conditions – which occur in, for example, dead ends or crevices of materials – were not the same as those dominating in biofilms developed in dynamic, flowing conditions (pipes). “We investigated the genome content of the dominating strains to identify genetic factors that potentially contribute to strain-specific, competitive, biofilm-forming capacity”, explains the PhD fellow. All the single, dual and multi-strain biofilms contained a considerable number of viable L. plantarum cells, representing a potential source of contamination.